You’ve heard the phrase, “You are what you eat”. We don’t take this phrase literally, but we should. Just think about it. How do you feel after eating a Double Cheese burger and french fries? Don’t get me wrong, I love a burger and fries just as much as the next person and I am by no means a raw food or energy guru. But after eating a burger and fries (as yummy as it is going down) I feel heavy, gassy, uncomfortable and completely lethargic. As if it has sucked the energy right out of me. 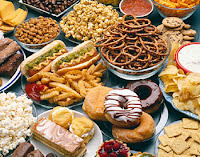 This is the epitome of low-vibration food: foods that are processed and filled with pesticides, chemicals and preservatives. Now the opposite. Think about how you feel after eating a big fresh salad with lots of yummy veggies or a bowl of just picked berries? I feel light, strong, uplifted and full of energy. These are high-vibrational foods: Foods that are unaltered and in their natural state… meaning not striped of all it’s nutrients, by let’s say, covering it with butter, adding chemicals, freezing it and then (over)cooking what’s left of the good stuff out of it. Every living thing has a vibrational frequency. Basically it is electrical energy that is measured in hertz. Here is a chart found on lexiyoga.com describing the vibration levels of some processed foods vs. fresh foods. The foods we eat can affect our frequency one way or another. When I am in a bad mood, grumpy or even depressed I typically crave low vibration food, which pushes you even further into that unwanted mood. Like attracts like… bad mood=bad food. When I am feeling great I don’t crave ‘itis’ inducing food. I want to be healthy and make smart choices about food. Well, the first thing is to eat more consciously. If you are feeling low, make it a point to eat some higher-vibration fruits and veggies. The next thing is to pay attention to when you are feeling low. Was it after a meal? After a restless night of little to no sleep? After a night of alcohol binging? Pay attention to what your body is telling you and make adjustments. Something you can do everyday is to try to start lunch and/or dinner with a salad. Go to your local farmers market and get some fresh organic produce. Yes, organic is more expensive sometimes, but quite often you will find that there is not a huge price difference at local farmers markets and at the end of the day it is worth it to replace some items with organic. Dekalb Farmers market- a 140,000 square foot ‘big box’ farmer’s market. Inexpensive, large variety and they support small local farms. Morningside Farmers Market- strictly organic and local produce. Sweet Auburn Farmers Market- they have a new local and organic corner. Piedmont Green Market- voted top 5 in the Atlanta area, lots of local vendors. Reopening May 2012. Peachtree Road Farmers Market- the only producer only market in the metro area—mean this stuff is literally farm to table. Reopening April 2012. I hope you found this information useful. The goal is to get you thinking about what you are putting in your body and make the best choices with what is available to you. Choose high vibration food when you can and pay attention to your body. What are some things you do to keep your vibrational frequency as high as possible? I’d love to see you ideas in the comment section below. Very interesting article. I know that the food we ate was also affecting our emotions. What if we eat meat, does it also make us a quick temper? Dalam game agen poker online uang asli android ini banyak anggota bandar poker terpercaya yang akan memperoleh bonus besar. Hadiah yang dapat anda peroleh dalam game bandar poker terpercaya ini ada juga banyak jumlahnya. Judi Online Agen Poker Online Agen Taruhan Bola Bahkan juga service bandar poker terpercaya ini juga akan dapat memberi anda service paling baik yang diperlukan anggota yang ada didalamnya. Jadi silakan saja anda bermain dalam game bandar poker terpercaya ini agar anda dapat memperoleh kekayaan.